12 year-old Travis Barclay and his little sister Whitney are sent begrudgingly on a summer trip to visit their grandparents’ farm in Delbert County. A greedy land developer, Norm Blandsford, has been buying up the little country town, running the hard working residents off their land. After Travis has a run-in with one of Blandsford's men, he is chased into the forest where he stumbles upon a magic portal to the hidden world where Paul Bunyan lives. Paul has been in self-imposed exile for 100 years, ever since the advent of machines made his role in society obsolete and left him feeling of little value to the new world. Paul, reluctantly, escorts Travis back to the farm. But upon returning, Paul witnesses Blandsford’s sinister plan. 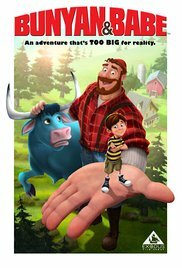 Suddenly filled by a long-forgotten sense of purpose, Bunyan and Babe, the blue ox, get wrapped up in a brand new adventure and together with the help of their new friends, Travis and Whitney, they save the town. They learn firsthand that you don't have to be big to accomplish big things. Read more on Wikipedia.